Ferguson was released from the Texans' practice squad Tuesday. Analysis: Ferguson just joined the squad last week, so his time there was short-lived. The former Illinois standout was waived by the Colts on Sept. 18 after three years with the team. He is now set to look for a new opportunity. 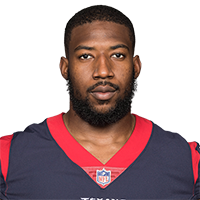 Ferguson was added to the Texans' practice squad Tuesday, Aaron Wilson of the Houston Chronicle reports. Analysis: The former Illinois standout was waived by the Colts on Sept. 18 after he spent parts of three seasons with the team. In 2017 Ferguson appeared in 10 games for the Colts, rushing for five yards on one carry and adding three catches for 16 yards. 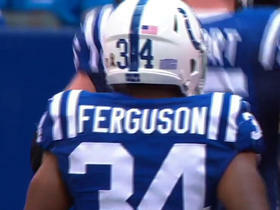 Ferguson (groin) was waived from injured reserve Tuesday, Andrew Walker of the Colts' official site reports. Analysis: The decision will free up an additional roster spot for the Colts who seem keen on adding depth at the receiver position. It's too early to tell how things will pan out for Ferguson, but the options seems limited for 2018 at this point in time. Ferguson (groin) reverted to the Colts' injured reserve Thursday after clearing waivers, Andrew Walker of the Colts' official site reports. Analysis: Ferguson was waived/injured Wednesday due to the groin injury he suffered in Monday's preseason tilt with the Ravens. He'll now spend the year on the Colts' IR, unless he reaches an injury settlement with the team. Analysis: The groin issue Ferguson suffered Monday appears to be serious enough to warrant a trip to injured reserve, prompting the move to open a roster spot for the re-signing of Tion Green as a depth option. Ferguson suffered a groin injury and will not return to Monday's preseason game against the Ravens. Analysis: Ferguson missed the preseason opener with a nagging hamstring injury, and he now has the groin issue to contend with. The severity of the injury is currently unclear. Ferguson (hamstring) was back in full pads at Tuesday's practice, Andrew Walker of the Colts' official site reports. Analysis: Ferguson has missed most of training camp with a hamstring injury, but looks to be nearing full health after returning to full pads Tuesday. He is currently buried on the depth chart, so he will need to turn some heads if he hopes to land on the final roster. Ferguson (undisclosed) did not play in Thursday's preseason win at Seattle. Analysis: Ferguson is likely battling for one of the final roster spots as a depth running back and special teams player, so his absence won't help. Ferguson (undisclosed) didn't participate in Friday's practice, Andrew Walker of the Colts' official site reports. Analysis: Ferguson is rarely called upon for offensive duties -- he had four touches in 2017 -- as he gets most of his reps on special teams. Getting back on the field quickly will be crucial for a chance at making the squad. Ferguson may need the Colts to opt for four running backs in order for him to make the 53-man roster, and even in such a circumstance, he'll battle with Robert Turbin (suspension) and Christine Michael for that spot. Ferguson had one carry for five yards, three receptions for 16 yards and 86 kick return yards in 2017. Analysis: In his second season, Ferguson had less responsibilities on offense due to rookie fourth-round pick Marlon Mack's emergence. Still, he kept his consistent place on the roster with his special teams contributions, and he'll continue to battle for offensive reps in 2018. Ferguson had three receptions for 16 yards on three targets in Sunday's 30-10 loss at Jacksonville. He also returned three kickoffs for an average of 17.3 yards. Analysis: Ferguson played 16 snaps on offense mostly late in a blowout loss. He went four games without a snap on offense, so he'll likely only get playing time in lopsided games.